It was January. Most of the stuff in my inbox and online was focused on the latest healthy snacks and tips for conquering New Year’s resolutions. The latest diet fad. Exercises to get back in shape and lose the holiday weight. Marie Kondo tidying. 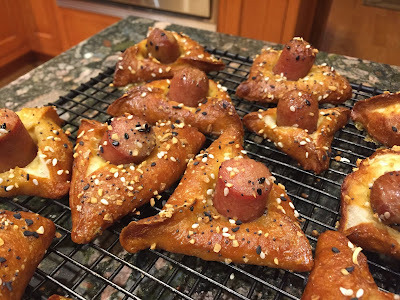 And then, out of the blue, I came across a recipe for Pretzel Bagel Dog Hamentaschen. Wait, isn't Purim in March? What was this recipe doing in my consciousness in January? I bookmarked it, intending to make it a little closer to the holiday. But the bookmark kept calling my name, haunting me in my sleep. I am a relentless softie for soft pretzels and uncompromising hot dog lover. I love these two foods, separate or together. 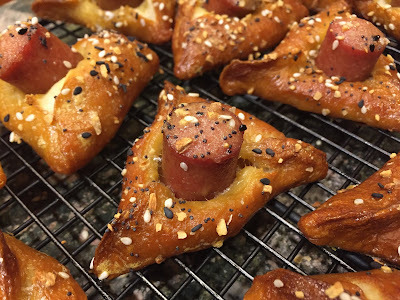 And bagel dogs are their own category of heaven. You’d almost think I was cheating on chocolate and peanut butter. 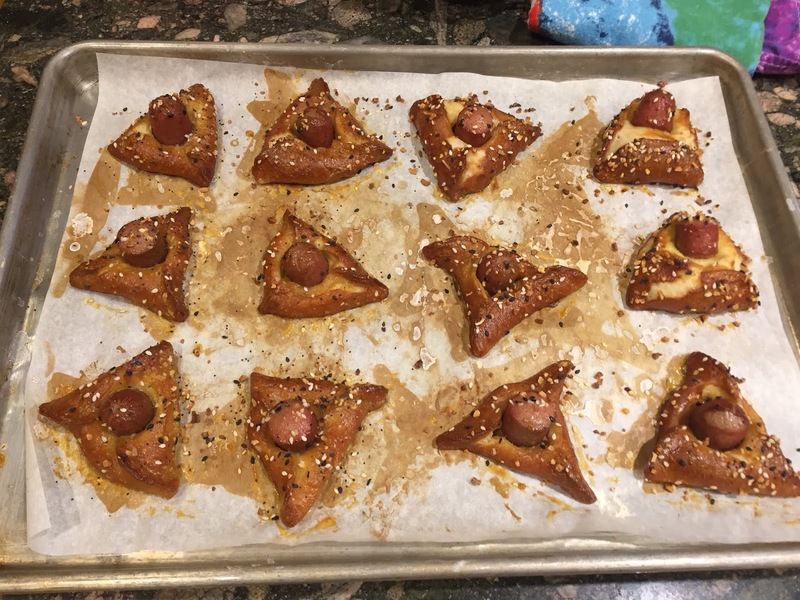 Unable to wait until March, I went shopping for the ingredients and set out to make this savory, unconventional Purim treat. Two months early. 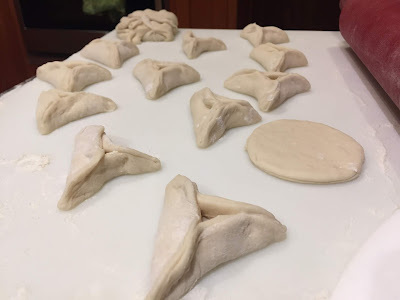 The dough was easy to mix together, and easy to roll out and shape into hamentaschen. Boiling the dough gave it that quintessential bagel chewiness. Boiling the dough in a baking soda bath gave it a perfect pretzel flavor. The hardest part of the whole project was squishing hot dog pieces into the center of each boiled, not-yet-baked hamentaschen. But you just have to have a little faith. The resulting treat is so delicious, so chewy like a bagel, pretzely like a soft pretzel, salty from the hot dog, and just plain fun to look at and eat! Maybe Purim in January is the new Christmas in July. Prepare three baking sheets by lining with parchment paper. Set aside. In the bowl of a stand mixer fitted with the paddle attachment, stir together the 1 ½ cups water with the yeast. Let sit for a few minutes. Add the salt, oil, and sugar and stir to combine. Now mix in 3 cups of the flour. 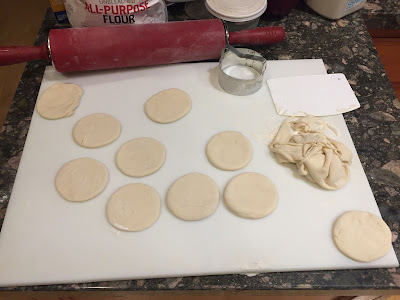 Switch from the paddle attachment to the dough hook attachment and add up to one more cup of flour, a ¼ cup at a time, until the dough mostly comes together and pulls away from the sides of the bowl. Always err on the side of too sticky so you don’t add too much flour. Transfer the dough to a floured work surface and knead until the dough is smooth and forms a soft ball. If it’s sticky, dust with more flour. Place the dough in a plastic bowl and cover with a tea towel. (If not using a plastic bowl, just be sure to grease the bowl first, then place the dough inside, and turn the dough over so it’s greased on both sides.) Allow the dough to rise in a warm (but not hot) area for 15 minutes. I like to place my bowl of dough in the oven where it’s free from drafts; just make sure the oven is not on! While the dough is rising, start the water bath. In a large, wide soup pot, stir together 9 cups of water and the baking soda. Bring to a rolling boil. When the dough has risen for 15 minutes, take the dough out of the bowl and cut it in half with a bench knife. With the first half, roll the dough out to ¼-inch thick on a floured work surface. Use a 3-inch round cookie cutter to cut as many circles as you can out of the rolled dough. 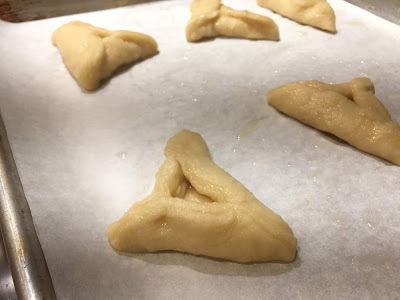 Bring three corners of each round of dough up toward the center and pinch well together to form a hamentaschen shape. Press the dough scraps together and re-roll to cut out more rounds. 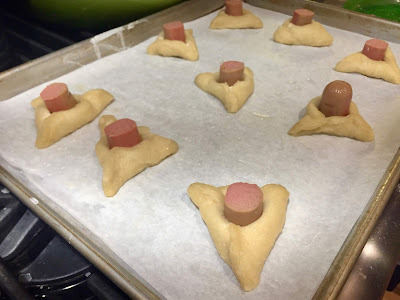 Place the triangle-shaped dough rounds onto the prepared baking sheets, three per row. Continue with the other half of the dough. Doing four at a time, drop the shaped hamentaschen into the boiling pot of water face down, watching the clock to make sure they are only boiling for 15 seconds. 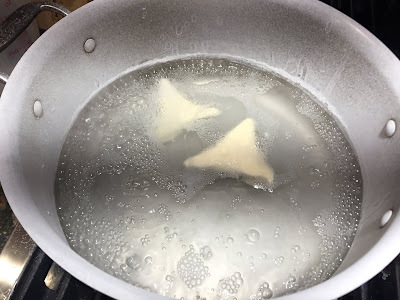 Use a mesh skimmer (bagel strainer tool) to quickly remove the hamentaschen from the pot, shaking out any excess water, and place them, face up, on the baking sheet. They should be spaced out enough so they don’t grow together while baking. Slice the hot dogs into ¾-inch long pieces. 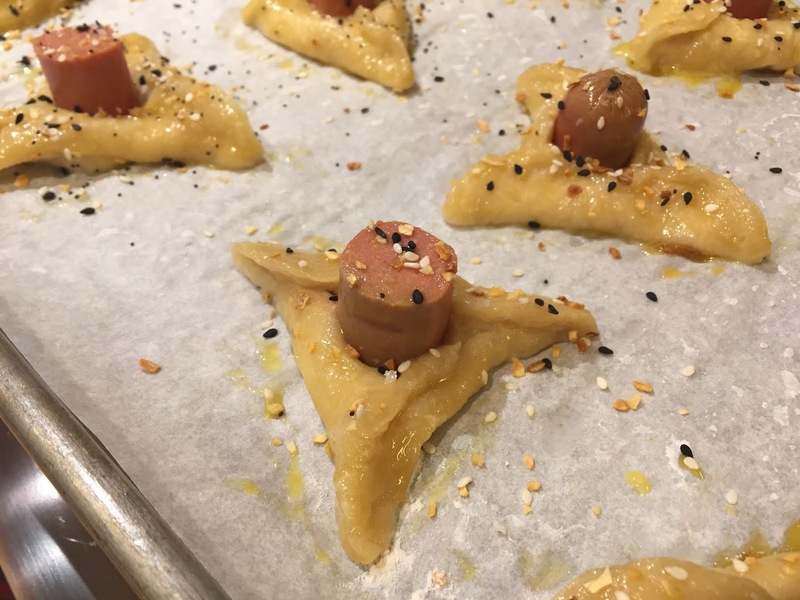 Place one hot dog piece into the center of each hamentaschen. This might seem tough because the dough is pinched together at the center, but just push the dough open a little so the hot dog has room. 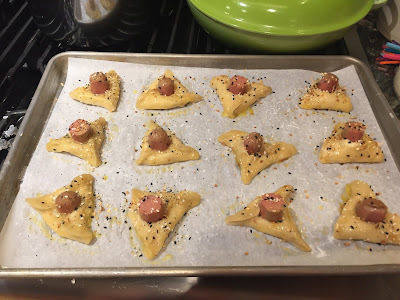 Brush the beaten egg on each hamentaschen and sprinkle the top with Everything Bagel seasoning. 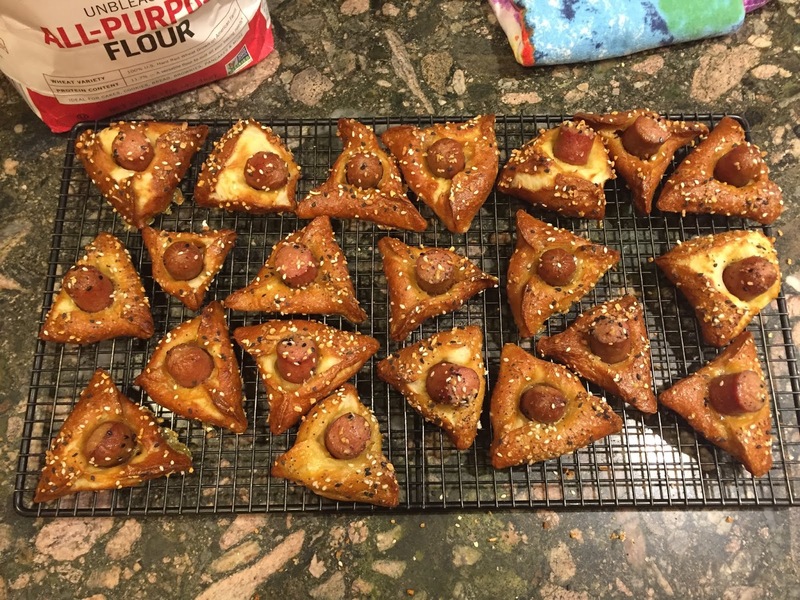 Bake for 15-20 minutes, until the dough is golden brown and pretzel-colored. Serve warm or at room temperature with a side of mustard. Shana tovah! Happy New Year! I always look forward to this time of year because it centers around family and food. Mmmm. Two of my favorite things in the world! And it just feels like a really special time. All the fine china comes out, the pretty tablecloth, the fancy candlestick holders, and the house looks extra tidy. The aroma of incredible baked goods or sweet apricot chicken and praline pecan-topped kugel waft through the rooms. I wanted to make ice cream for Rosh Hashanah, so I started to think about appropriate flavors for the holiday. Really, anything sweet would probably suffice, since this is a holiday all about sweetness. But could I be more spot-on with my flavor choice? Yes. Apples and honey! The question then became, how the heck do you infuse those two flavors into an ice cream base? 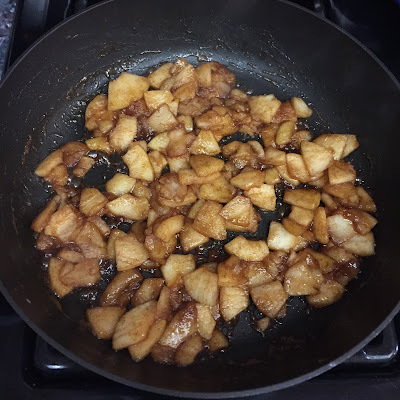 I decided to make a honey ice cream by swapping out the typical granulated sugar called for in ice cream and replacing it with half a cup of honey, and then I caramelized some apples to stir in during the churning process. It worked out great! This ice cream is everything I hoped it would be! The essence of Rosh Hashanah captured in ice cream! Pour the heavy cream into a large bowl and place a strainer over the bowl. Set aside. In a saucepan, warm the milk, salt, and honey. In a medium bowl, whisk the egg yolks. Pour some of the warmed milk into the egg yolks, whisking constantly so you don't cook the eggs and accidentally turn them into omelet! 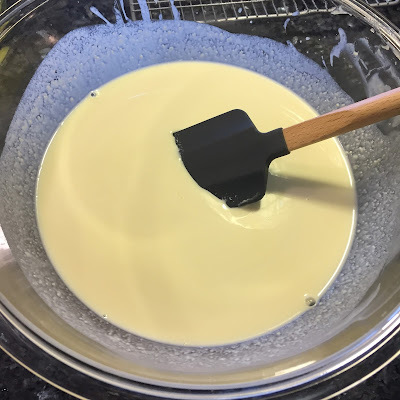 Continue adding the rest of the warmed milk into the egg yolks until all of it is combined and you've warmed the egg yolks, then pour all of this egg-milk mixture back into the saucepan. Cook the egg-milk mixture over low heat, stirring with a spatula constantly until the mixture thickens into a custard and coats the spatula. You can tell it is done if you swipe your finger down the back of the coated spatula and it leaves the mark of your finger. Pour the custard through the strainer into the heavy cream, then stir to combine. Cover and chill the mixture in the fridge for at least 6 hours or overnight. 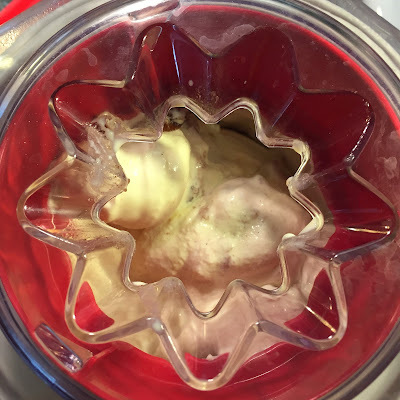 Once chilled, churn the mixture in your ice cream maker. 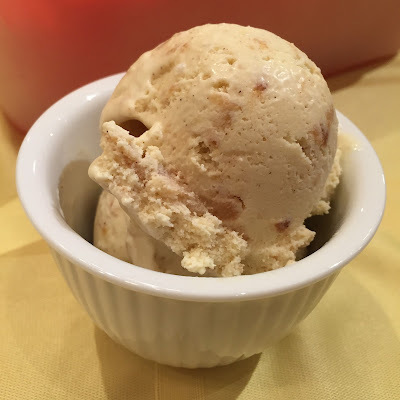 When the ice cream is almost fully churned, add the caramelized apples (see recipe below) by dropping them down the opening of the ice cream maker and allow to churn for 1-2 more minutes to incorporate. 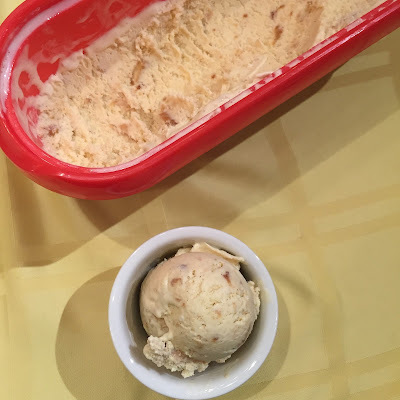 Transfer the ice cream to freezer containers and freeze until set. Enjoy! Squeeze the lemon juice into a medium bowl. Peel and thinly slice the apples and chop into 1-inch long pieces. As you are chopping, place the pieces into the bowl and turn to coat the apples with the juice so they don't brown. Stir in the sugar and cinnamon until well combined. In a skillet, melt the butter and add the apples. Cook on medium heat until the apples are softened and caramelized, about 15 minutes. Be sure to stir occasionally so the apples don't burn. Allow to cool completely before stirring into the ice cream maker. 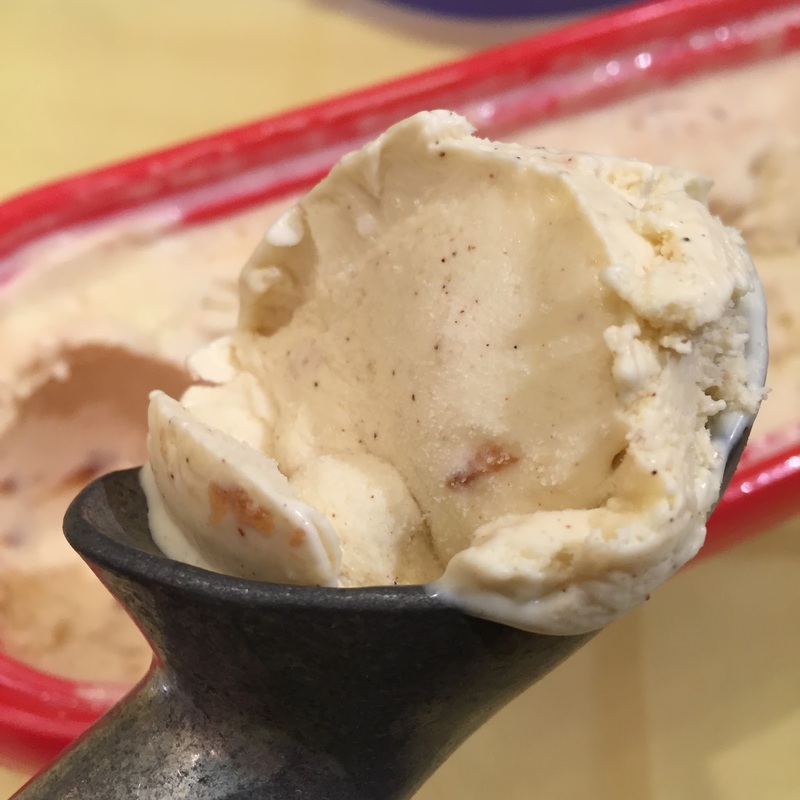 Allow the ice cream to set further in the freezer, then scoop and serve! So creamy and delicious. Apples and Honey Ice Cream! I got to my parents' house Thursday night and the first thing my mom says to me (after the big bear hug, of course) is, "Marni, you have to try these pecan bars." She all but stuffed one into my mouth. It wasn't exactly hard to give in and try one, but it was noteworthy that she was so eager. I mean, I'd just stepped off a plane and all she could think about was feeding me this bar. Her alacrity was justified. One bite, actually, one look at these bars, and I knew I'd be sleeping happy (and waking up and going to the gym - but it would be worth it). Just when I thought there'd be no new baking revelations this Passover, my mom drops this on me. Kaboom! Kerpow! And now I am a changed woman. Forever. Can a Passover Pecan Bar do that to a person? Yes, and I can't wait for you to try this. 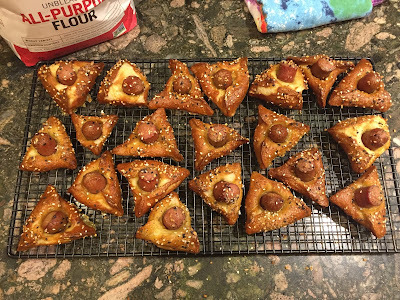 In fact, I urge you to use your leftover Passover ingredients after Passover is over and make this to bring to a picnic, or a work party, or whatever. No one will know it has matzah meal in it, but if they ask what's in it, tell them the truth. It will shock them. Unfortunately, because my mom had already made these by the time I arrived, I wasn't there to take step-by-step photos. So these few finished product photos will have to do. I think you'll survive! 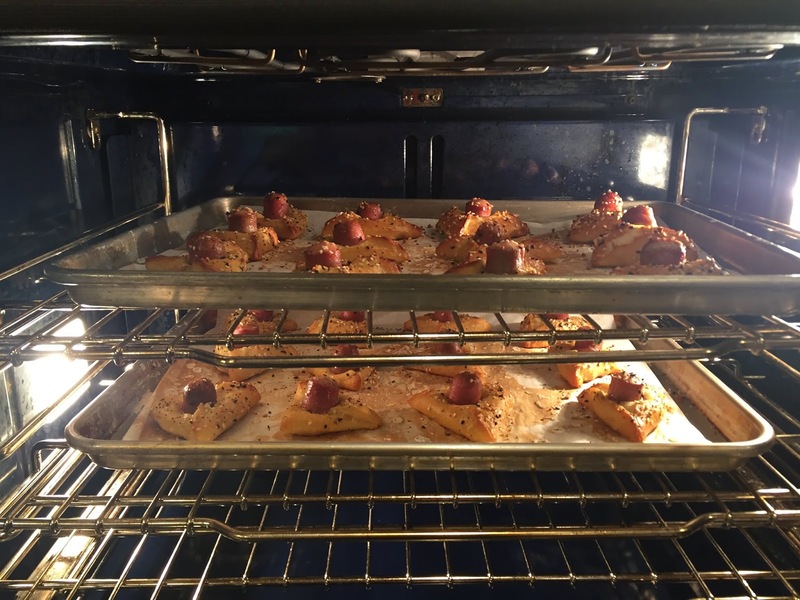 Preheat the oven to 350 degrees F. Lightly grease a baking pan. My mom used a 9x13-inch and highly recommends it! You can also use an 8x11 (smaller pan) and the bars will be taller, even gooier, and more like the pecan pie you're used to around Thanksgiving. For the crust, in a food processor or large bowl, stir together the matzah meal, cake meal, pecans, brown sugar, salt, and cinnamon. Add the butter and pulse in the food processor or use a pastry blender to cut the butter up into small morsels so that the crust mixture is crumbly. Add the egg yolk and stir to incorporate. Use your fingers to squish the mixture together and then press it into the prepared baking pan. Bake for 20 to 25 minutes. You'll know the crust is done when the edges are beginning to brown, but are not too dark. Cool on a wire rack for 15 minutes. For the filling, in a large bowl, combine all of the ingredients and whisk to incorporate. Pour this filling onto the cooled crust and return to the oven for 20 to 25 minutes. Cool completely on a wire rack, then place in the fridge to chill further so that the filling sets. Cut into squares. A little goes a long way because these are so gooey and indulgent, so even bite-size pieces would work well. Makes 3 to 4 dozen heavenly bars. 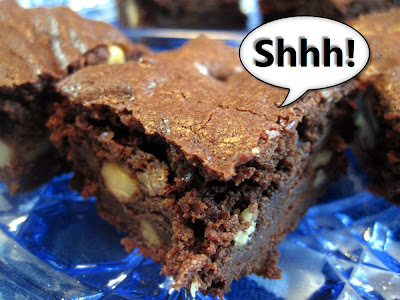 Passover Brownies That'll Fool Anyone: Mwahahahaha! Abracadabra, hocus pocus, make me a Passover brownie that will fool anyone! I chanted this spell as I put these Passover brownies in the oven, and apparently I'm quite a good witch. My magic worked! 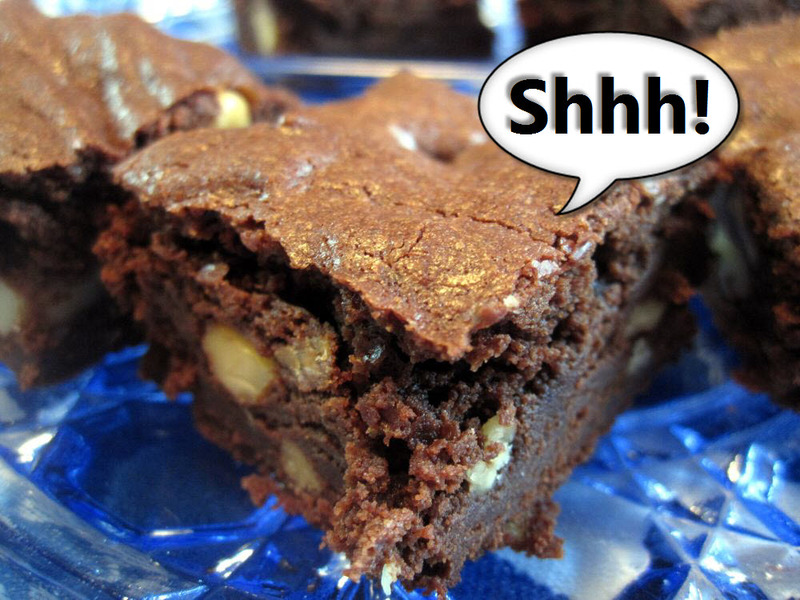 These brownies are, yes, technically kosher-for-Passover, but you would never ever know. I'd bet money on it in Vegas. Even the most discriminating palates and Michelin-rated chefs would have no idea. I am that confident I could fool anyone. There is 1/3 of a cup of matzah cake meal in place of 1/2 a cup of flour in an already certified, tested, heavenly brownie. And because they're so easy to make, it would be a shame, a tragedy, and at the very least, pretty lame, for you to make a Passover brownie mix instead. Please don't. Preheat oven to 400 degrees. Position a rack in the lower third of the oven. Line an 8x8 metal pan with foil and drape extra foil over the edges so you can lift the brownies out later for cutting on a cutting board. Melt the butter and chocolate in a saucepan over medium-low heat, stirring frequently until the mixture is melted and smooth. Be very careful not to burn the mixture. If you think you're not the careful type, use a double boiler or heatproof bowl set on top of a pan of gently simmering water. It's a lot harder to burn chocolate and butter when using a double boiler. Remove the saucepan from the heat. Stir in sugar, vanilla, and salt. Add eggs, one at a time, stirring in each until it is well incorporated. Beat in the matzah cake meal until the mixture comes away from the sides and looks smooth and glossy, about 1 minute. Stir in nuts, if using. Pour the brownie batter into the foil-lined pan. Bake for 15-20 minutes, until brownies just begin to pull away from the sides of the pan. The surface of the brownies will look dry but a toothpick inserted in the center will still be quite gooey. That's a good thing! While the brownies are baking, prepare the ice bath. Fill a roasting pan or large baking pan (a standard 9 x 13" pan works perfectly) with ice cubes and water about 3/4-inch deep. When brownies are ready, take the pan out of the oven and immediately place in the ice bath. Careful not to splash water from the ice bath onto the brownies! Cool the brownies completely in the ice bath. When cool, remove the pan from the ice bath and lift the foil edges up and out of the pan and place the foil on the cutting board. Cut the brownies into squares to serve. Store in an airtight container. Because these are fudgy, they will taste delicious for at least 3 days, and if you're lucky, up to 5 days!